Keeping an American Toad as your pet can be a rewarding experience and they’re great for beginners. Their enclosure doesn’t require a huge investment, they’re not picky eaters, and they’re widely available in the United States. This care sheet covers a list of the items you’ll need to keep American Toads as pets. Not only that, I’ll show you how to set up their cage, what to feed them, and I’ll give you some information regarding toad husbandry. American toads inhabit regions in South America, the United States, and Canada. The Genus Anaxyrus contains three subspecies; the Eastern American toad, Dwarf American toad, and Hudson Bay toad. All of which are ‘true toads’, belonging to the Bufonidae Family. Their colors range between gray, brown, black, and yellow. Some are more solid in color but most are speckled. Setting up an enclosure for an American Toad is about as easy as it gets. Probably the most important part of the entire setup is getting the correct substrate and making it deep enough. I have some suggestions to help you get started but for now, here is a list of the items you’ll need. Toads don’t require a lot of space but the more the better. Most frog enthusiasts follow a simple rule; 10 gallons per frog. This holds true for the American Toad. A 10-gallon aquarium will house one toad. A 30-gallon aquarium will hold 3 or 4. However, if you want to use a 50-gallon aquarium for a single toad, that’s fine too! There is no limit to the size. Oh, last but not least, make sure your enclosure is fitted with a screen lid to keep the toad from escaping. 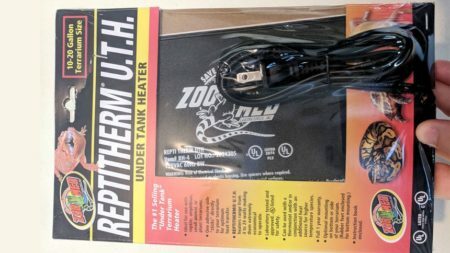 Fill the bottom of the tank with a non-particulate substrate, at least 2 inches deep. These toads love to burrow, so a loose substrate like coconut fiber is recommended. Read the substrate section below for more information on this topic. You can add leaf litter on top of the substrate to create extra hiding placing. Place cork bark, branches, logs or other decorations suitable for hiding. Add a sturdy, shallow water dish at one end of their enclosure and fill it with clean water. Live or fake plants are welcome. Just remember, these toads love to burrow so they might damage the roots of your live plants. 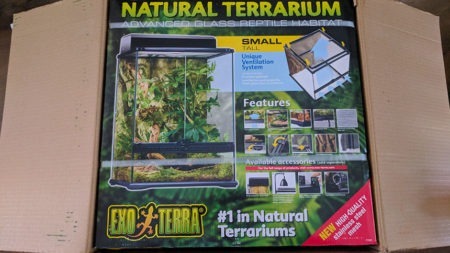 I recently made a guide on how to set up a terrestrial frog enclosure, which is perfect for an American Toad. Click here to learn more. 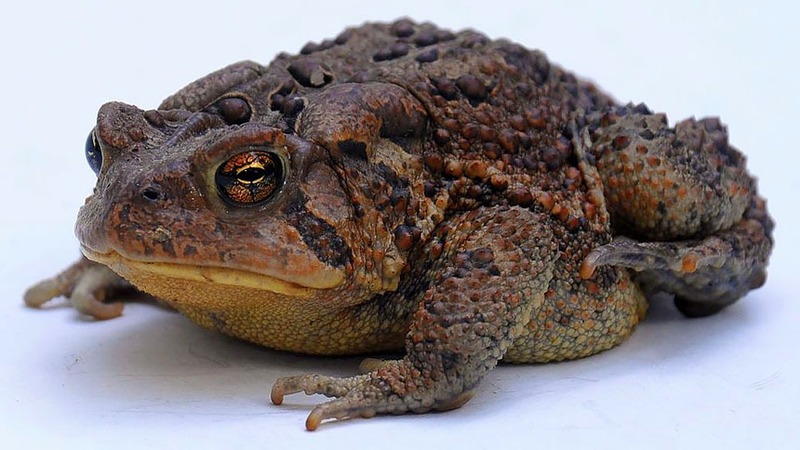 American toads are mostly nocturnal, spending their days hiding under leaves, burrowed in the soil, or otherwise relaxing in cooler temperatures. That’s not always the case, though. In fact, just the other day I found one hopping through my yard around 6:00 PM. But, in general, they’re likely to wait until nightfall to venture out for feeding. As such, UVB lighting is not a requirement. 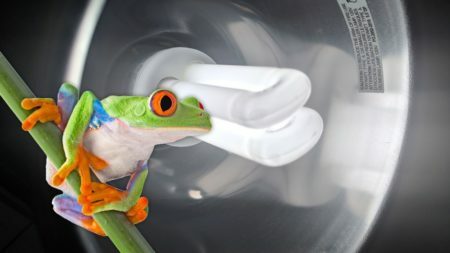 Should you decide to place live plants inside their enclosure, a full-spectrum LED light, catered to growing plants will make a welcomed addition to your toad’s enclosure. What’s most important is your pet has a day and night cycle, especially if you’re keeping them in a room that doesn’t receive natural lighting from windows. If this is the case, then yes, please provide them with a light! I recommend between 12 – 15 hours of light each day. In the wild, toads are exposed to a wide range of temperatures. They prefer temperatures ranging between 60 – 75 degrees Fahrenheit. In the United States, it’s not uncommon to have 90 – 100 degree days during the summer. To survive the heat, they burrow in the ground or hide under leaf litter in cool, dark areas. If the average room temperature in your house is around 70 degrees, you’re good to go. At night, the temperature can drop a few degrees without harming your pet. Provide places for your toad to hide during the day. Cork bark flats, leaf litter, or decorations are always helpful. Having these hiding areas will allow them to keep cool, if they choose, during the day when they’re not as active. American toads like to burrow. With this in mind, you should provide them a substrate suitable for burrowing. Coconut fiber substrates like eco earth are well suited for this. Other options include plantation soil, ABG mix or soil mixed with peat moss, coconut bark or amphibian friendly mulch will all work well. The depth of the substrate depends on the size of your toad. As a minimum, fill the enclosure with at least 2 inches of substrate. A full-grown toad may prefer 3 – 4 inches of soil for proper burrowing. In addition to the substrate, you can introduce leaf litter for hiding spots. This isn’t required, provided you have other hiding places like decorations, branches, plants, etc. 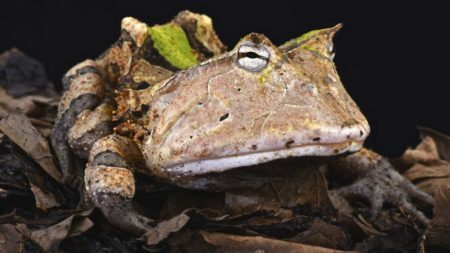 Leaf litter is typically seen in tropical terrarium setups to create hiding places for smaller frogs. Not only does it help your pet feel more safe, having a nearby hiding place, but, over time, the leaves break down and add nutrients back into the substrate which helps live plants remain healthy. The American Toad is from the Bufonidae Family, also known as “True Toads”. Unlike frogs, true toads can survive a little better without water. This is why you’re more likely to find toads farther away from a water source than frogs. However, they’re still amphibians and they do require water. Toads have semi-permeable skin which allows them to absorb whatever comes into contact with them. Due to this, clean, toxin-free water is essential for their health. Using tap water is often the quickest and easiest way to fill your toad’s water dish, but it can be dangerous. This depends on your local water supply, of course. Some tap-water contains chlorine, fluoride, chloramine, and other chemicals. All of which are harmful to amphibians. On the opposite side of things, using distilled water may seem like a better alternative because it’s 100% clean water. Unfortunately, this isn’t the answer either. You see, distilled water lacks the natural minerals these toads are used to in the wild. The best solution is to use water conditioners like ReptiSafe or, perhaps, use bottled water. Having said that, fill a small, shallow water dish with clean, dechlorinated water. Do your best to never let them run out of the water and change it often to keep the water clean. Ensure they cannot dump or otherwise knock-over their water dish. Toads survive in a wide range of relative humidity levels. What’s most important is having a small water dish with clean water available at all times, which allows them to soak their skin whenever they want. As for the humidity level within the cage, try to keep it around 50% humidity. This can fluctuate 15% up or down at any given time. To be precise, you can use a hygrometer to read the humidity level within the tank. 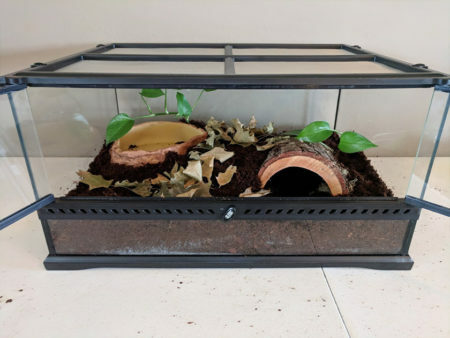 A hygrometer is nice, but it’s not a requirement provided you always keep their water dish full and you mist their enclosure 2 – 3 times per day. Increasing the humidity is as easy as misting with a spray bottle. In the wild, a toad’s diet usually consists of a variety of invertebrates; spiders, worms, crickets, slugs, etc. 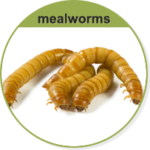 In captivity, however, it’s easiest to feed them whatever is available at the local pet store; crickets, waxworms, superworms, mealworms, etc. Juvenile toads should be fed appropriately sized insects daily. 1/8 inch crickets or fruit flies will suffice. Adults can eat full-grown crickets and all the insects listed in the previous paragraph. 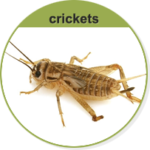 Feed them 3 – 6 crickets each day. It’s always best to have a variety of foods. 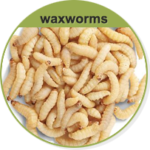 If their primary source of food is crickets, give them the occasional mealworm or waxworm as a treat. 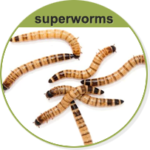 All the insects you feed them should be dusted with vitamin and mineral supplements. It may be wise to consult a veterinarian for the proper amounts, if possible. Otherwise, a good starting point is to dust with a calcium supplement daily and use a vitamin and mineral supplement 2 – 3 times per week. American toad husbandry can go either way in terms of success. Many keepers find they don’t require special conditions to get their pets to breed, while others have no luck. If this is your case, you might want to consider simulating their natural environment during the breeding season. Simulate the winter months with cooler temperatures, less water, and less humidity over 2 – 4 weeks. After that, raise the temperature, add more water, and increase the humidity for a few weeks. This will mimic the transition from winter to spring. Sometimes this is all that’s required to get them to breed. Before we get too far into the husbandry section, it’s important to know the difference between a male and female. Juvenile toads can be difficult to distinguish but adults are a little easier. A full-grown male grows between 2.3 – 3 inches in length and a full-grown female measures between 3.5 – 4 inches in length. So females are slightly larger than males. Perhaps the easiest way single out the males is to listen for their call. Watch them in the act, if possible; males have a loud call. American toads typically breed in the spring, between March and May. With the rise in temperature and more abundant rainfall, these toads are ready to reproduce. In a captive environment, however, seasonal changes are not the same. If you’ve had a male and female in the same enclosure for several months already, and they’re not breeding, you will most likely have to simulate their natural environment to get them to breed. To do this, lower the temperature in their enclosure 5 – 10 degrees and stop misting for 2 – 4 weeks. So long as they have access to water in their dish, they will be fine. Also, decrease their day-time light cycle to 10 – 12 hours per day. Maintain these condition for two to four weeks. Next, you’ll want to simulate spring-time by increasing the temperature back to normal or slightly above. Also, change their day and night cycle to provide 14 hours of light and 8 hours of dark. Begin misting their cage again and consider adding another water dish or swap their current dish with something bigger. With any luck, the males will begin calling around night time. Should you be successful, you’ll find your toads in the amplexus position. This is where the male grasps his arms around the female. The female then passes the eggs through her cloaca; the male then fertilized the eggs outside the body. They will remain in this position for a few hours or even days. At this point, you may want to consider transferring the eggs to a separate container. Use one large plastic container and fill it with 2 – 3 inches of clean, dechlorinated water. The temperature should be kept between 70 – 75 degrees Fahrenheit. After you’ve transferred the eggs, be patient and wait. They should hatch in 4 – 10 days. Once they’ve hatched, you can begin feeding the tadpoles. 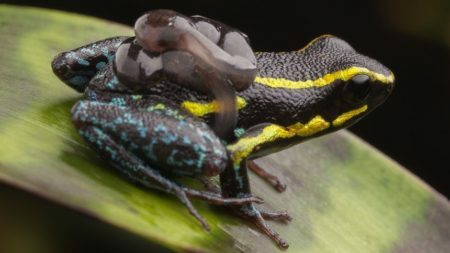 In the wild, tadpoles feed on algae. As they grow, they begin to eat leaves, plant stems, and, eventually, dead insects. In captivity, it’s perfectly fine to feed them a pinch of lettuce or cabbage each day. 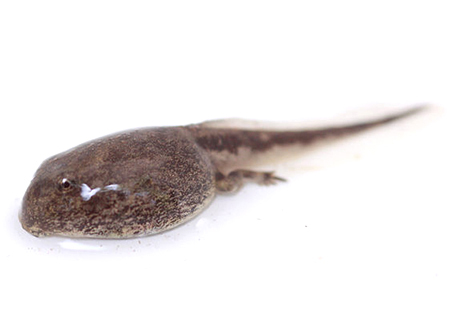 Another option is to give them “Aquatic frog and tadpole food” or any other commercial tadpole foods. Sprinkle the food on top of the water, only giving them what they can eat in about 3 hours. Remove any uneaten food after 3 – 4 hours and provide partial water changes twice per week or as needed. Also, as the tadpoles grow and take up more space, you may need to separate them into more containers. Continue this process until your tadpoles metamorphose into juvenile toadlets. The entire process will take approximately 2 months. As the toadlets begin hopping around, you can start feeing them little fruit flies and pinhead crickets. Do your best to avoid handling them as much as possible; it can be harmful to both you and the toad. As I mentioned earlier, their skin absorbs things it comes into contact with. 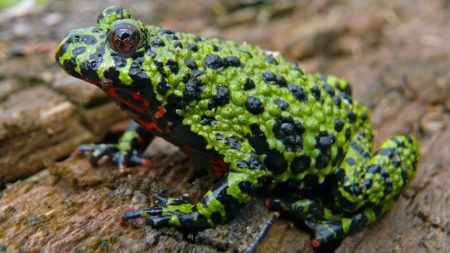 Chemicals on your hands can be absorbed by the toad, which can potentially be harmful. Before holding, ensure your hands are clean and slightly wet. When finished, thoroughly wash your hands with anti-bacterial soap. This species is one of the few toads known to carry bufotoxin, a white substance secreted from their parotoid glands. They cannot secrete the substance at will; it has to be squeezed out. Should you happen to get bufotoxin on your skin, don’t touch your eyes or mouth. Carefully sit the toad down and go clean yourself. To learn more about this subject, click here. Transferring your pet from one container to another is okay. After all, you’ll need to clean their enclosure from time-to-time. Just do your best to limit handling as much as possible.